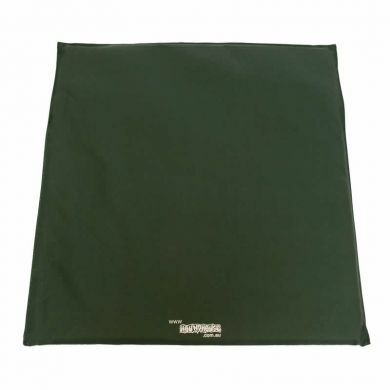 HoundHouse scratch resistant mats are sized to fit snugly inside the HoundHouse Dog Kennel. Great for in the back of the ute, to take camping, or as a throw anywhere mat. 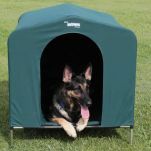 It can be used as a protector for other dog kennels or as a replacement when your dog's mat is old and tired. 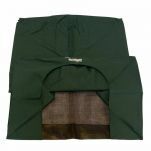 The HoundHouse mats are made from the same heavy duty cotton breathable waterproof canvas material as the HoundHouse kennel covers so they won’t heat up when your dog takes a nap. HoundHouse Canvas Mats hose clean and have 2.5 cm foam inner. Read 2 customer reviews of HoundHouse Kennel Mat . The average customer rating is 4.5. We bought the hound house kennel mat as back up for our hound house kennel. We used it on a recent camping trip as her bed when we were sitting by the campfire. It is easy to move around the site. This is a good quality mat. Our dog is an inside dog and he sits on it in his corner. The material used allows you to wipe it which is good.